Whether you dress up or not, catching a flight is an occasion. The thrill of getting to the airport early, the possibilities of what you’ll buy, eat or drink once there or during a connection, all of it is exciting in its own way. For those frequent travelers, the thrill and excitement might wear off, so it’s important to be prepared and be versatile, to make taking a flight as smooth and comfortable a process as possible. Need some help? Below are five items that aren’t required, but by adding one or two to your travel bag (or even a new bag itself) you’ll definitely eliminate a few airport related headaches. Keeping smart phones, tablets, etc. charged has become a must. With the dwindling supply of airport outlets, you might need to provide an alternate form of power for your gadgets. Shaped like a swiss army knife, this charge tool allows for iPhone, iPad, and even Micro USB connections used by Droid devices. Plug in your computer, and charge your business tools, or share with your neighboring travelers, utilizing the smallest of outlet supplies. Similar to the above tool, these packs store the power to use whenever and wherever you need it. The above link is for the Duracell Powermat, which can help your item stay charged for 24 hours, but numerous alternatives are also available. One key thing to note here, make sure the charging product you choose supports your device, as they can be Apple or Samsung specific. Working at ten thousand feet a problem when the drink cart rolls around? Not anymore. Say hello to the “Nearly” Universal OH cup holder, which attaches quickly and easily to airline armrests. 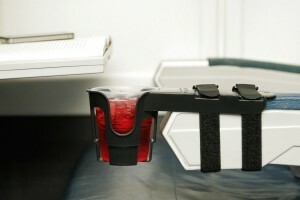 Keep your laptop, tablet, or even old fashioned paperwork out while you sip casually from this cup holder at your side. Got a few hours to kill? Up early to catch that flight? Take a timeout for yourself in the form of a pleasant nap. Why not go all out, with a pillow, eye mask, ear plugs, the works, getting lost in that sweet, sweet land of Z’s. There’s even a few refreshing towelettes to wipe any reminders of rest that might linger and make you look disheveled once you deplane to meet your business colleagues. As the costs to check bags continue to rise, more and more passengers are pushing the limit of what they can carry on. Whether going away for a few days, or just in need of a bag that totes your laptop and novel, a versatile carry-on is becoming more of a must. The one linked to above serves as a briefcase, backpack, or even a messenger bag. We tried to find the best bang for your buck in the products listed above, but whether using these or looking for the exact fit for your travel needs, be sure to check places like Amazon and eBay, as the selection and price range for travel products vary widely. PreviousPrevious post:Does New Disney Policy Punish the Many for the Sins of a Few?NextNext post:Is Your Health and Retirement Worry-free?